There are dozens of bloggers who probably don’t know how supportive I am of their work. I should say something but fear my intentions would be spun into something negative so I pass. She’s only commenting to connect to a popular blogger. She’s trying to improve her site search. She’s trying to promote something that she’s doing. Etc. That would hurt. I know people are out there like that. If I respond, my intentions are genuine. Sometimes I get over it and do it anyway. Figuring out exactly what I’m trying to state is lost on me. Much like real-life, human conversation and I go. Similar to when you figure out what you were trying to convey and how to do so but the moment is gone. Most of my supporters are quiet but I’ve had an outpouring of encouragement outside of my blog- facebook, email, twitter, word of mouth from family and friends and in person. I’m very grateful for that and I truly adore my supporters. Since starting the dabble in July 2009, I’ve had to come to terms with the fact that general blogging etiquette is to respond to another person’s website if they have commented on your post. I wasn’t aware of this for a long time and still am kind of clueless about blogging etiquette. If I come off rude, I apologize. It’s courtesy to comment back and I gladly will. You obviously felt my post enough to say something and I love reciprocating. I’ve made a few great connections with other bloggers this way and adore our relationships. I’d like to meet them some day. Sure, there have been a few insulting comments from people who love the anonymity factor of the blogosphere. What possesses someone (besides anonymity) to leave rude comments or email? I have my notions but that’s enough for a book. I’m always second-guessing myself. Do I send out a private message to people on twitter when they follow me or when I add them? Do I send out one message to everyone or make it personal? How do you respond to flickr comments? If someone adds me to their blog roll (sites that person enjoys), is something expected of me beyond a message that I am grateful? If someone adds me to their blog roll (if I even know about it), how do I handle that? When someone FF’s me on twitter (Follow Friday which I learned helps suggest that others follow you from a kind person who likes you), do you return the favor or do what I used to do and simply thank them kindly? A woman did this to me every weekend for months and I would tell her how truly grateful I was…then at some point she stopped and ‘unfollowed’ me…what’s that about? That leads me to believe I was supposed to do it back. Am I supposed to ignore when “popular food sites” fail to give me credit for my material? As a blogger, am I supposed to ignore the thousands of posts about rightfully claiming your material (even hypocritically posted on some of these “popular sites” that didn’t give me or my blogger friend credit)? Is it one of those issues where that’s what is said but not done- the etiquette really being that you let it go or face ticking people off further up the chain that can ignore you for the remainder of your blog’s existence? I’m glad they highlight bloggers like me once in a while and still cherish their work but knowing at least one of their reps is rude is a little unsettling. Was I not supposed to point it out in the nicest way possible (too nice sometimes)? So the guessing goes on and on. Right now, if I want to follow you after checking out your site, I will. If I want to give you a shout out, it will be on my blog and rarely on twitter. I don’t send out private messages thanking you for following me that I can remember but that doesn’t make me ungrateful. If I’m feeling you and your work, I might add you to twitter/flickr/facebook/tumblr/etc. but I am not above ‘unfollowing’ anyone for any reason and it’s not personal 9 out of 10 times. What’s your idea of blogging etiquette? I know one thing I try to do on here is mind my manners and lead you to a tasty recipe. Today’s food find is a snack in my top 5 all-time favorites. Greg, my husband, described these as tasting similar to “tiny, baked potatoes of joy.” Low in calories, big on taste and you could probably pull these out and impress your guests by not counting on the old bag of potato chips routine…especially if you call them edamame and not soy beans. Sounds better. I politely thank you for stopping by and hope to see you again. *You can add 1-2 tsp of spice like cayenne, cumin, or paprika or a combination for a change. Preheat the oven to 400F. Thaw and drain the edamame and pat dry. 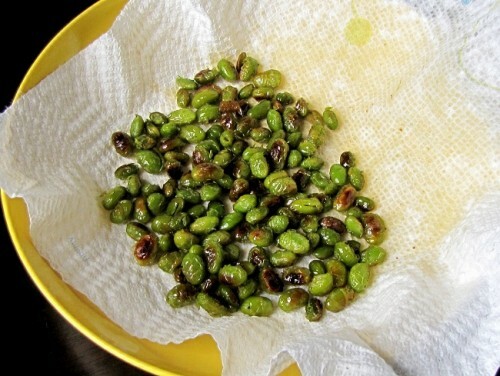 Toss the edamame, salt, pepper and olive oil in a bowl. Spread in a single layer on a baking sheet and roast for 45 to 60 minutes, or until browned. Shake or stir the edamame around every 15 minutes or so and keep an eye on them so they don’t burn. Place in a serving bowl with or without paper towel to absorb the excess oil. There are no rules. The only people that get uppity about it are people that think there is really anything to gain. No, you don’t have to answer me. It isn’t rude. Phew, I’m glad you answered. I will comment though to tell you that I find you refreshing. In a world where people are afraid “to call it as they see it,” I am glad you took a stand, Janis. If blogging ever devolves into a wedding-shower death-spiral of excessive reciprocity and etiquette, I’m outta here. Count me with the majority of people who don’t get uppity about the rules. And the Follow Friday thing similarly gives me agita; I’m never sure how or if I’m supposed to do something in return (besides thank them w/an @reply, which I do… usually). Too many FF tweets just seem like the digital equivalent of a person walking into my house, yelling 8 people’s names, and then walking out. I try to give other folks a more deliberate shout-out, explaining briefly why I follow them so my little audience might want to do the same. I’m glad to find that I am not crazy…I’m just encountering some of the crazy bloggers taking etiquette way too seriously (not surprised..I have been a magnet in the past in the “real world” for the unstable). I had a good chuckle about the FF description, I’ve probably said something similar to Greg. If I find someone or thing so enthralling, I’ll write about it in a post at longer length than social media outlets will allow. The extent of my use of those sites is to communicate to the friends I’ve made announcing a new post and perhaps a clue about my day to family/friends. I’m really not a rule follower either, and I like Kat said, if it comes to that blatant reciprocity I’ll likely turn tail and race into the woods to disappear. I love the community I’ve found through blogging, interactions on Twitter and other outlets, but I don’t scratch the backs of those blogging friends with any expectations that they’ll visit, kick my stats up a notch and ping me to the ends of the earth. And I don’t want some random ‘Yum!’ comments on my posts. They mean nothing to me. I’ll tell you how your blog post makes me feel if it moves me, but I’m not going to smother it with rhetoric just to be heard. That’s not my style. The rules, for this girl, do not apply. Annie — Thanks for this post! I, like you, am a silent follower most of the time. I started my blog because I love to cook and write, not to become a superstar. If I comment on someone’s post, it’s usually because I have something to add to the conversation. Not commenting does not mean I didn’t read the post/didn’t like it. I don’t expect reciprocal comments because I don’t always have the time or energy to do the same. I blog for the fun of it and refuse to let some supposed “blogging rules” discourage me from doing what I love. That’s just silly. I am a semi-silent follower of many in that I don’t link their blogs on mine (in part because I read way more food blogs than beer blogs) and I only comment when I feel I have something worth saying (usually along the lines of a recipe that is so good I’m drooling in front of my computer or I have made/tasted what is being written about). After this post I appreciate your comments on my blog all the more and I am quite sincere when I say if you and Greg do come to Portland for a visit, at the very least I’d be happy to give you a mile long list of places to visit. If you’d be up for it I’d enjoy meeting you in person over a few pints as well. Anyway, keep up the good work. Keep us up to date on what you’re cooking and how the home plans progress. We will gladly take you up on that offer, Kris. That would be great! I am the same way when it comes to a blogger I haven’t come to know while looking at tastespotting/foowgawker/tasteologie and so on. I will leave a comment on those that I am either impressed with or drooling over and not expect anything in return but it’s not very often. Thanks, Liz. That’s a great point. Hi sweet girl…I loved hearing about your experiences navigating through the blogging world. It is something that I’m trying to figure out too. I’ve received such love and support from so many people over the last few days. Far more than I could ever reciprocate. Thank you for sharing your heart and these tasty beans, my dear. Visiting the blogs that I’ve come to love this year brings me such comfort. Thank you for being such a sweet and uplifting presence. Have a great Friday. Thanks, Monet. I hope your spirits are lifted today and all life through. Your blogging presence and friendship means so much to so many of us bloggers. Like you said, it’s hard to know what’s the “right” thing or “expected” thing to do. I respond to comments on my blog if there are questions or if I want to thank them for an awesome compliment. I try to visit back & leave a comment but I don’t just leave a comment just to leave a comment. It’s impossible to answer to every single one because I get so busy but I often feel guilt over this. As far as twitter, I’ll tweet a new follower if I have something to say to them, I don’t DM unless it’s a private convo and hate Auto DMs. 🙂 This is a really great post because it’s a lot of the same questions I had when I started out. And your roasted edamame look awesome. I’m going to Pin/bookmark this for later. Thanks! PS- I do the same thing. I don’t like coming accross as needy or as a user. I finally made myself start commenting because I love it when others do the same. I like to know that there are others who read my blog besides me and my mom (lol!) I always make sure my comments are very genuine and mean everything I say. In hopes it comes across the same way I mean it to 🙂 I always give credit when credit is due and love hearing good feedback. I recently discovered roasting green beans just like this edemame and they are very addicting! I will be sure to try the edemame soon. Green beans are 20-30 minutes if you want to try. I do love your blog, recipes and healthy ingredient choices. Thanks, Natasha! I know what you mean; I love my familial support but knowing I’m reaching others helps keep this blogging train rolling. I will have to try the green bean version. This roasting veggies/legumes is quickly rising in my top snack list.